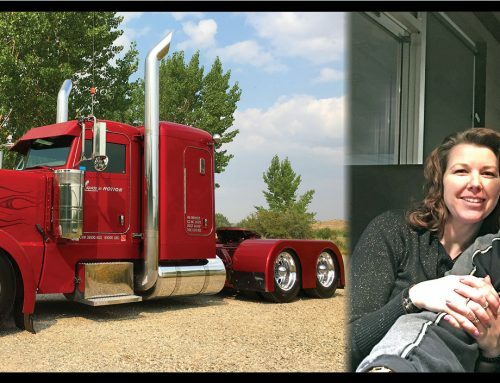 Our November Rig of the Month driver is Dale Howard who has been writing very informative articles for Pro-Trucker for the last few months. Dale is very knowledgeable and has had a varied work life but he has always returned to his love of driving. My dad had a road building company so I was introduced to Trucking at a young age. I loved spending time with him around the gravel crusher and also riding in my Uncle George’s gravel truck. My dad instilled a strong work ethic in my formative years and I always strive for perfection in all I do. When the road building company was sold my dad semi-retired and bought a farm. That gave me the opportunity at an early age to drive grain truck and tractors and I was soon hooked. In high school, I washed trucks on the weekend for my cousin John Henderson until I turned 18 and went into the motor vehicle branch in Calgary and got my Class 1 license. That was back when licensing was done right in Alberta and the inspectors were all government employees, not private company employees. As soon as I got my license John gave me my first driving job. 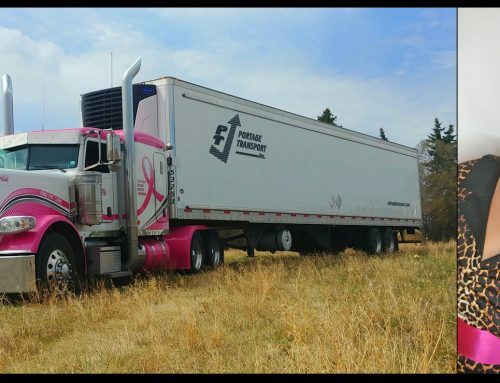 Henderson Trucking was primarily a flat deck company running Alberta. I gained a lot of experience hauling concrete slabs, fertilizer and running a broken arm picker. Being a flat deck company I can honestly say I can haul anything on a deck. We hauled a lot of precast material that was always a challenge to secure. I remember many loads that I used every chain and strap I had in my possession. Bag fertilizer was always a treat (insert sarcasm) because they were 50-pound bags and you would handle every bag on the trailer. The only saving grace is I was young and in the best shape of my life. I was paid percentage and it was a good rate and so I made pretty good money. My early years of trucking were in the days of regulation meaning you could only haul certain commodities in certain lanes so there were lots of empty unproductive miles. Like many of you, when I first started driving there were a few drivers who stand out as people that taught me valuable tricks of the trade that helped me along the way. Two of my mentors in trucking that really stick out in my mind were, Larry Jesperson and Lin Hardisty. They not only taught me how to drive but they also taught me so much more about trucking. With persistence, my cousin put me in a brand new 1979 Louisville 318 Detroit, 13 speed and I was in heaven. At that time there were no hours of service rules in Canada so if you slept at all it was poor planning on dispatch’s part. The truck I was driving had no sleeper so you got what sleep you could across the seats and after hand-bombing 50,000 pounds of fertilizer, it was not that hard to go to sleep. I did that for a year or so and decided it was time to be an owner operator so I bought my first truck. It was a 1978 F model Mack, my first truck with a sleeper, 300 plus ten speed which was leased onto Trans Mutual Truck Lines hauling flat decks and convertible hopper trailers in Alberta, BC and the western US. I felt like I had hit the big time. I was only 20 years old and my first trip was a load of bulk fertilizer to Dawson Creek. I loaded in the afternoon and headed north stopping for the night in Beaver Lodge Alberta. With this being my first sleeper truck naturally, I slept in and didn’t get to Dawson creek till 11 am. I was scared as I had just bought a truck and I was late with my first load and now I thought I was going to be fired. Fred the dispatcher didn’t help when he told me to be sure and see him when I got back as we needed to talk. Gulp… I reloaded grass seed for Camrose Alberta and slept that night across the gate so they had to wake me to get into work I unloaded and then came back to the yard to face the music. Fred and John Ruteck, the owner, explained to me it was easier to call a customer and tell them the load would be late rather than phone them and tell them the truck was involved in an accident and their freight was scattered all over the highway. What a relief – no more panic. I had to stay in Canada until my 21st birthday before I could go south and my first U.S. trip was a load of cedar to Fresno California and then I had to pick up bulk potatoes out of Bakersfield California to take back to Calgary for old Dutch foods – now I was really in the big league. In 1980 I ordered my first new truck a 1980 Transtar 4300 IHC 380 cat and I got to pull “B” trains when they first came out. 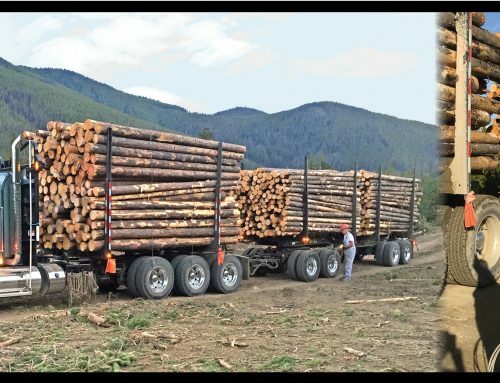 At Trans Mutual, we primarily hauled lumber south then drilling mud from Montana or Wyoming up to Fort Saint John and Fort Nelson. We would also haul cedar down to Denver Colorado then head over to Rockport Missouri to haul bulk corn back to Canada. Tarping lumber was a weekly job and I took great pride in doing it right. To this day it makes me crazy to see a load poorly tarped. I left Trucking and went into the burglar and fire alarm business for a bit with ADT security systems installing and maintaining burglar and fire alarm systems. I progressed in the industry to the inspection of burglary and fire alarm systems. We had a distillery as one of our customers and it would take three days to check their sprinkler alarms. The smell of alcohol in the rack houses where they stored barrels of Whiskey to age was overwhelming and you would always leave a little light headed. 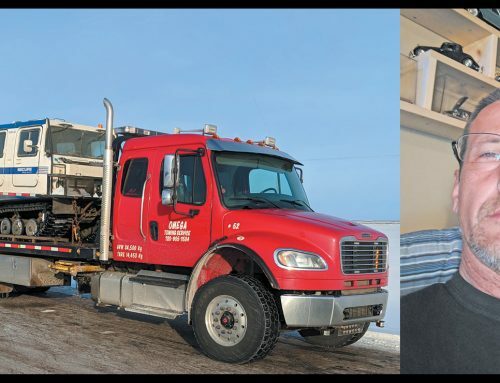 Loomis armoured car service was one of our customers and they noticed my work ethic and offered me a part-time job on the weekends. Since I enjoyed driving it was a great job so I left the alarm business and took a full-time position with Loomis. One of the perks was that I got to haul a substantial amount of high-value jewelry to Nakisa, the ski resort that was built in preparation for the 1988 Winter Games. We had a team of 5 and spent the weekend all-expense paid and paid around the clock. I also got to hob knob with the stars that were at an event to highlight the upcoming Winter Olympic Games in Calgary and raise money for the Canadian and USA ski teams. Brooke Shields and William Shatner I must say were the most down to earth stars I have ever met. In 1994 I left the armoured car service and ventured into law Enforcement with the Alberta sheriffs court and prisoner services I progressed quickly in my career and was promoted to the chief firearm training officer writing our training manual for the transition from revolver to auto loader handgun. This won me the Premiers Award for excellence in 2000. The deputy chief of commercial vehicle enforcement made a deal with our department to do some training for them. Seeing the value in us, seven officers were convinced to jump ship and transferred over, much to the dismay of the chief at court and prisoner service, but a real win for CVE. The last seven years of my career were spent with Commercial Vehicle Enforcement (CVE) in Alberta. 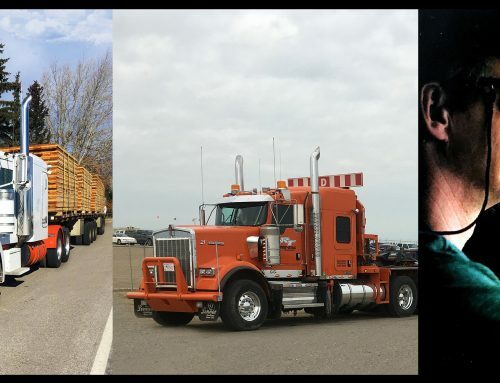 The call of the road was too strong and in 2007 I left CVE and crossed over to the dark side, or came to the light depending on who you talk to, and purchased a used Kenworth T2000 leased onto Bison Transport. This was an easy move as for the previous 9 years I had worked part-time running Canada and all over the United States when on my holiday’s and I did local driving on weekends. After deciding that I wanted one more new truck I purchased a 2010 Peterbilt 386 still leased on with Bison. This was a unique truck as it had a Cummins test engine in it equipped with def. It was nice to have two engineers cell phone numbers for problems and when you pulled into a Cummins shop you moved to the top of the list. I would pull into a shop and have the service writer tell me they were booking out to next Tuesday then after getting them to run the engine VIN number it was kinda humorous to see them get a puzzled look and tell you to go to bay 6. Following this, I decided I wanted to do more refrigerated work so I left bison and leased on with Traffix, a smaller company, which was extending its business into Alberta. Then the 2013 flood hit High River AB hard and I lost everything including my home. So I sold my truck and drove a company truck for Traffix. Needing to spend some time at home rebuilding my life, I left the highway and took a local job with “Bear Excavating “ hauling heavy equipment and gravel around the area doing acreage development and septic systems but since this was seasonal work the call of the road came back and I am now driving for Don Needham Trucking out of Claresholm Alberta hauling produce out of California in the Orange T680 Kenworth I’ve affectionately named the “Great Pumpkin” hauling a 53 foot utility reefer. My predominant lane is Calgary to Los Angeles so look for me on the I15 corridor and if you see me don’t forget to wave with all your fingers. I love hauling produce it’s nice to have a challenge and loading a six picker in California is always a challenge. thankfully we have great customers and things normally go smoothly. In my off time, I love riding my mule, Diesel, out in Kananaskis Country. A mule is a cross between a horse and donkey. Mom is a horse and in Diesel’s case, mom was a Percheron Draft Horse and dad was a Mammoth Jack Donkey so he is a big guy. Mules have so much more personality than a horse and are just a lot of fun to be around. A fun fact is the Percheron was the most fuel-efficient draft horse of the day, they did the most amount of work with the least amount of feed. Sadly diesel has forgotten this and loves his groceries. I look forward to chatting and sharing some compliance tips in the upcoming issues so stay tuned. If you have any questions please reach out to me on facebook and I will do my best to help you out. My passion is teaching and education in an industry that I enjoy giving back to. Safe travels, stay compliant and look forward to seeing you next month.